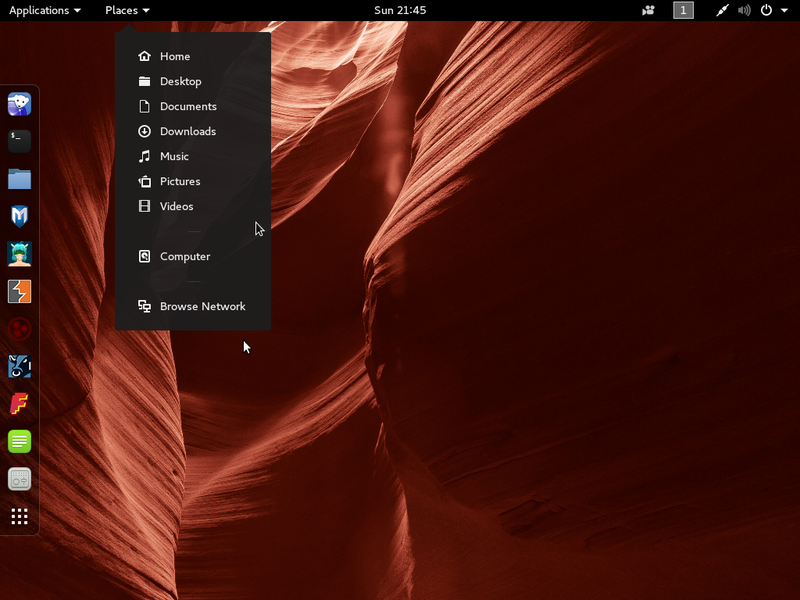 Chakra Edn 2011.11 is the second maintenance release of the relatively new desktop Linux distribution with some ties to Arch Linux. The first review of Chakra on this website was of Chakra Aida 2011.04. 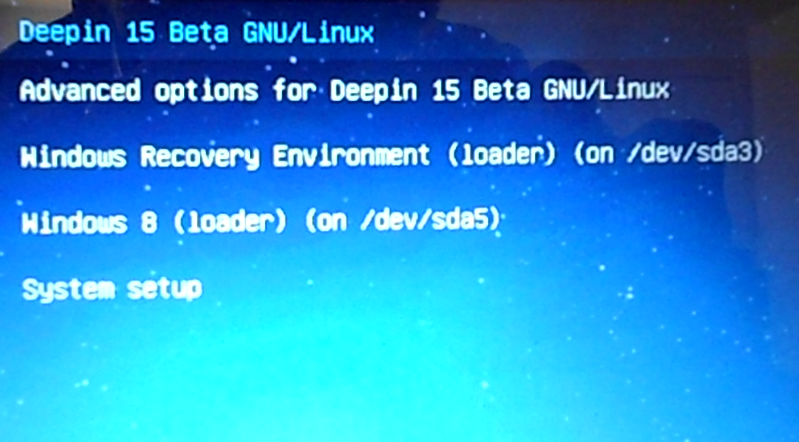 This screenshot is of the second screen of the boot menu. The first screen provides a list of languages to choose from. Installing A New System: Chakra is a semi-rolling distribution, which means that updates are delivered in what may be regarded as “Service Packs.” Since I did not have an existing installation to test the semi-rolling feature, the systems used for this review were all installed from scratch. The installation process itself is conducted via a graphical installer called Tribe. Though it looks nice, it is still a work in progress, is prone to crashes, especially during the disk partitioning step, and has a heavy feel to it. 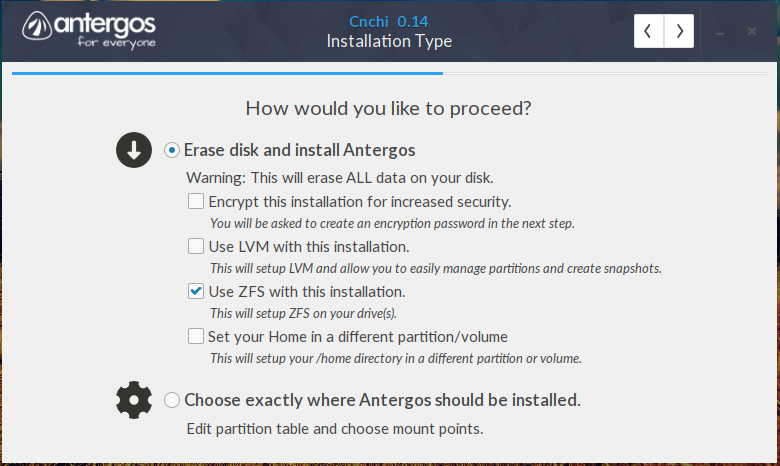 Because Tribe does not have automated disk partitioning options like the installation programs of Debian, Ubuntu, and other well known distributions, the disk partition phase of the installation process is manual. 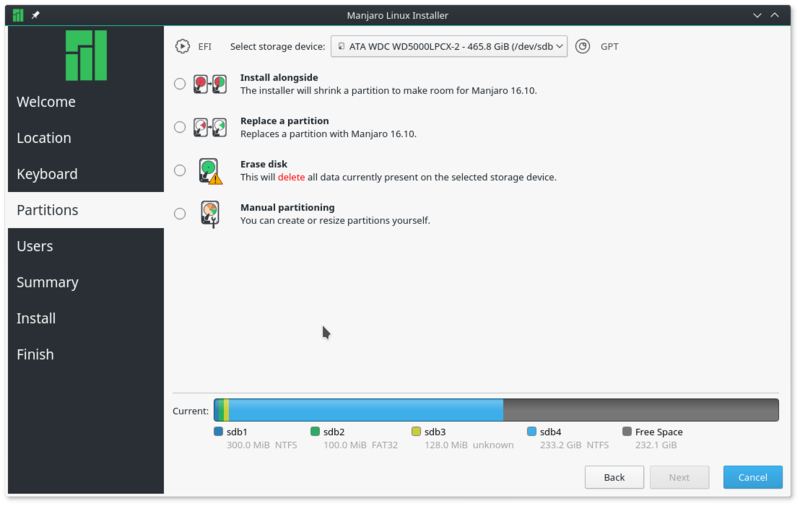 KDE Partition Manager is the disk partitioning program deployed for disk partitioning. Both GPT and the more common Ms-Dos or MBR disk partitioning schemes are supported, with GPT as the default. GPT disk partitioning guide for Chakra is a good starting point if you need some hand-holding in creating GPT partitions for a Chakra installation. Note that the disk partitioning aspect is prone to crashes and errors. 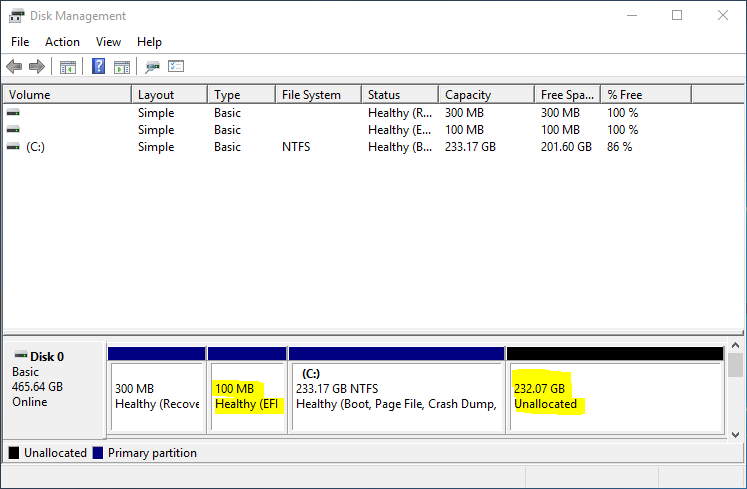 This screenshot show partitions created for a test installation, using a GPT partition table. You know it is GPT because an extended partition is missing. 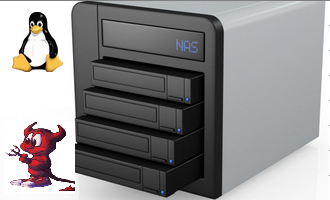 For a detailed article about this subject, see guide on disks and disk partitions in Linux. 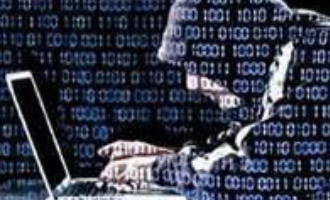 Aside from creating a standard user account, the user setup step provides options to either set a root password or disable it, so that sudo is used for gaining access to root privileges after installation. I always prefer running systems that use the traditional root account system, so every Chakra installation I have used always has a root password configured. 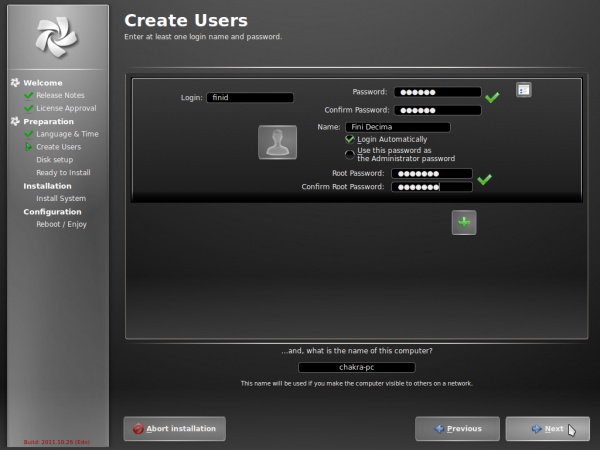 That means that I always disable automatic login at this step of the installation process. From a security stand point, automatic login is one feature that should be disabled. 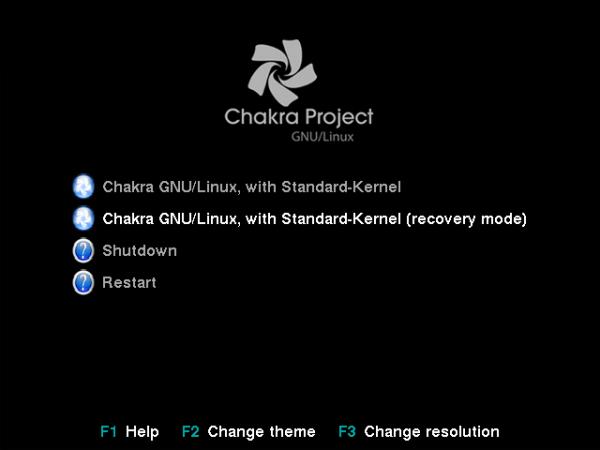 Chakra is a “pure” KDE/Qt distribution, so GTK applications are made available via the Bundle System. In Chakra jargon, a bundle “is a squashed filesystem, an ISO-like image, with all the files needed to run your app. 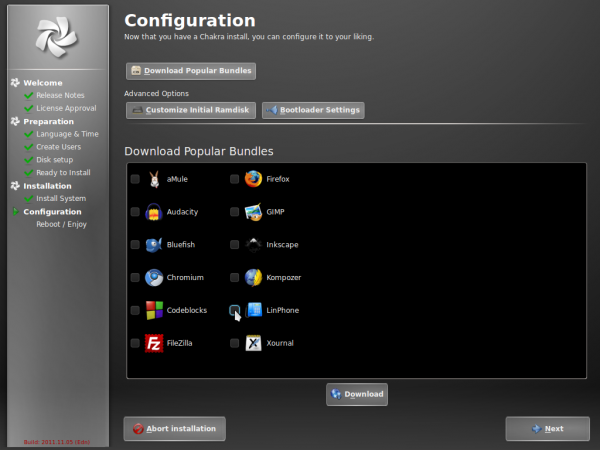 … without actually installing any file in your system.” During installation, you are given the option to install up to 12 popular bundles. They are shown in this screenshot. 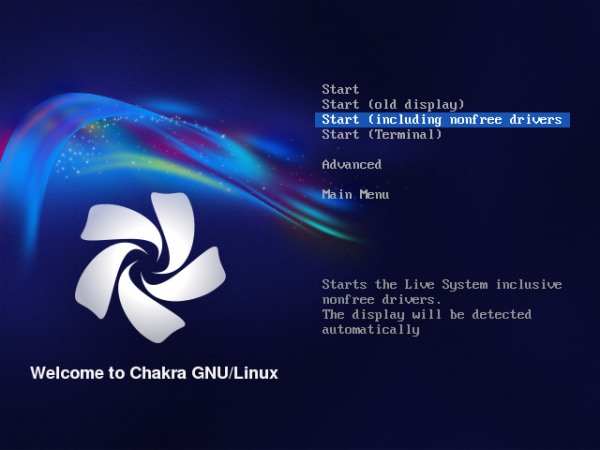 Chakra is the first Linux distribution that I know that uses BURG, a new boot loader based on GRUB, the GRand Unified bootloader, as the default boot loader, so that any time the system is (re)booted, you are presented with a boot menu that looks better that the traditional GRUB menu, with the option to change the theme, if you do not like the default. Shown in this screenshot is the default screen for BURG. Logging In And Using The System is via a login screen that unlike the Ubuntu Unity Desktop login screen, does not have a default guest session enabled. And the desktop is powered by the latest stable release of KDE – KDE 4.7.3. 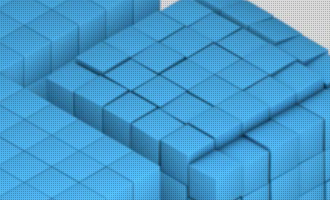 KDE’s performance issues have kept me away from using it on my non-crash-and-burn systems, but recent improvements have given me several compelling reasons to change my opinion about the popular desktop environment. And the mess surrounding GNOME 3 and Ubuntu’s Unity Desktop is more than enough reasons to move all my systems to a KDE distribution. Chakra’s default desktop configuration uses the not-very-popular Kickoff menu. Even with the newly implemented breadcrumbs, designed to ease the pain of navigation, it is still not a very fun menu style to use. That is why I still prefer the Lancelot menu, which has a widget that you may add to the panel in place of the Kickoff menu. 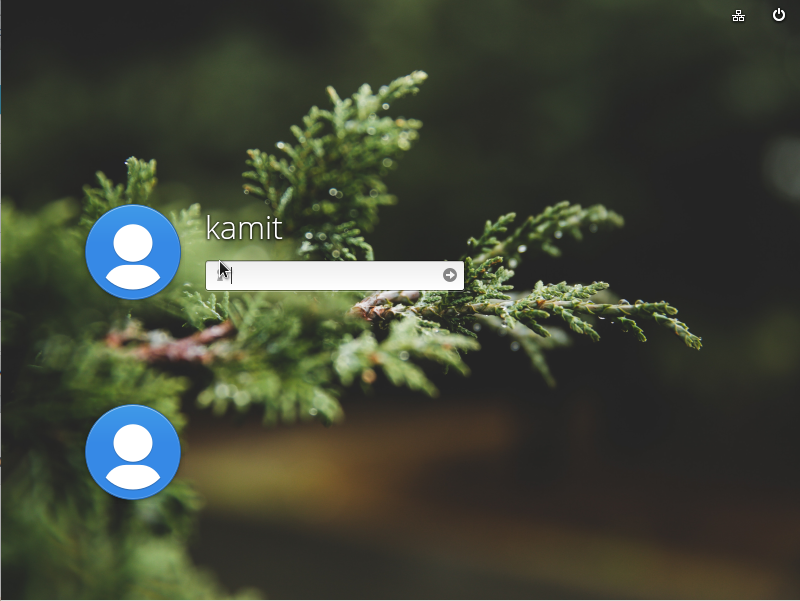 Another menu style for KDE that I even like better than Lancelot, is the Takeoff Launcher. 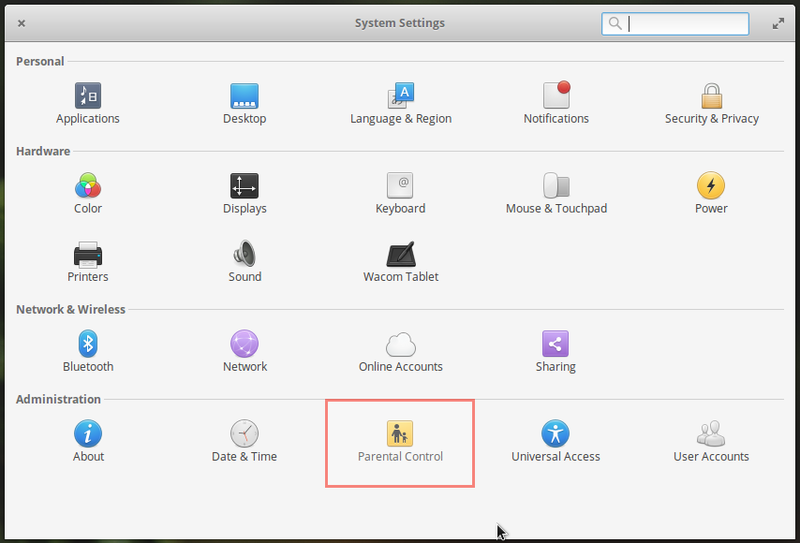 (See Takeoff with KDE’s best menu style.) It, and the Stackfolder (see a screenshot here), are two reasons I am considering going back to using KDE – despite its performance issues. 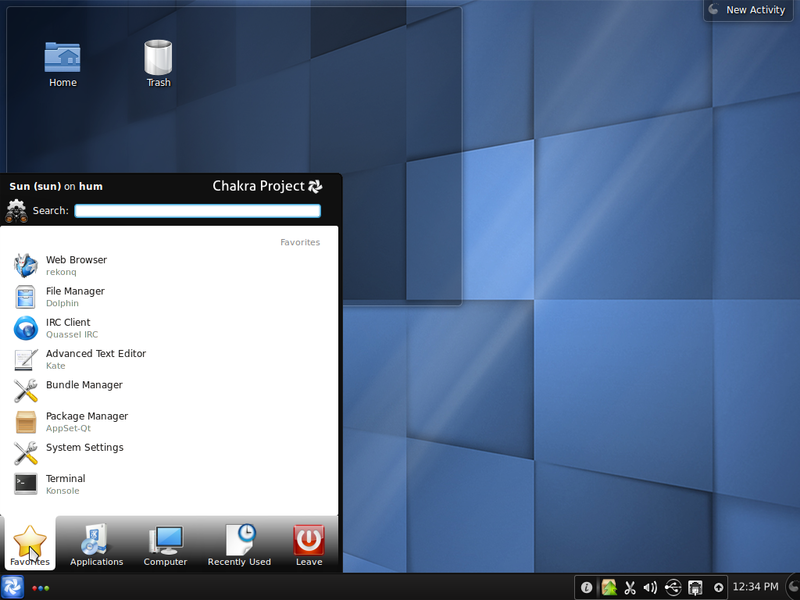 This screenshot shows the Chakra desktop with the Takeoff Launcher. Though it lacks a search feature, I find that it is a lot more user-friendly than the Kickoff menu. Regarding installed applications, the DVD installation is loaded with the right set of applications that most users would need to accomplish their daily computing tasks. Unless you chose to install Firefox and/or Chromium during the installation process, the lone installed browser will be reKonq, a native Web browser for KDE. Because Java JRE and a Flash plugin are not installed by default, even though they are available in the repository, I had to install both plugins. With so much Flash content on the Web, it does not make much sense to be surfing the Web without a Flash plugin installed. Why the developers chose not to install these application by default is something I do not understand. Bangarang and Clementine, are the installed video and music players respectively, and XMBC, a media center application, is installed. Like Flash plugin and Java JRE, libdvdcss, a library which Bangarang requires to play encrypted video DVD’s, is not installed. The question, as with Java JRE and Flash plugin, is, why is libdvdcss not installed out of the box? I think those are more important than having SpiderOak, a cloud-based backup application, and two e-book readers (Calibre, E-book Viewer) installed. The DVD image is just 1.4 GB, but not a single game is installed, though there are several dozen games in the repository. Device notification mostly worked. I say “mostly,” because it worked all the time when a video DVD is in the optical drive, but a 50-50 chance if an audio CD, is. With a video DVD in the optical drive, and Bangarang selected to play the DVD, Bangarang always crashed. The only way I could get Bangarang to start is by selecting it from the menu. Thank you so much for doing this review, this kind of feedback is appreciated. You are correct about the security issues, it has not had the attention it deserves in developing this Distro, and needs to be addressed in the next team meeting. As you mention, a Chakra ISO is GTK2 free, that ofc means, shipping flashplugin by default is not an option, it requires GTK2. The java-runtime shipped in the ISO for libre-office is openjdk, Chakra chooses foss options as much as possible, and let’s the user decide, if they prefer proprietary instead. Which brings us to the focus of Chakra. 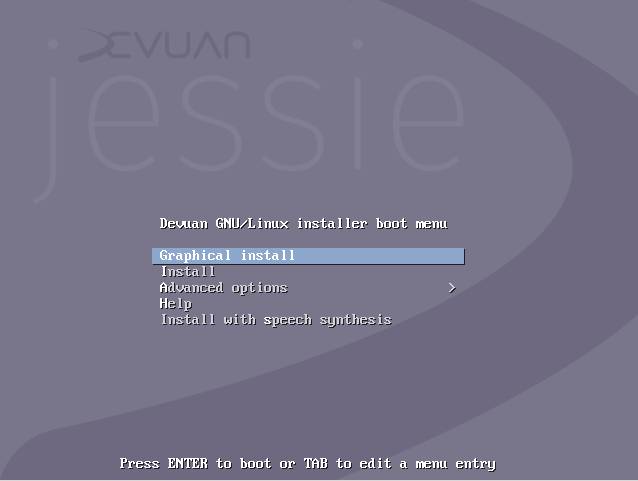 There are plenty of Distro’s, that require no user intervention, all is setup by default, but gives the user less power over the final installed system. That was never the goal of Chakra. The goal is an easy to setup basic system, were the user has all the power to make the KDE install their own, user intervention and Wiki reading is required. This part of the goal clearly needs to be better explained, and will be one of the goals for the next release. 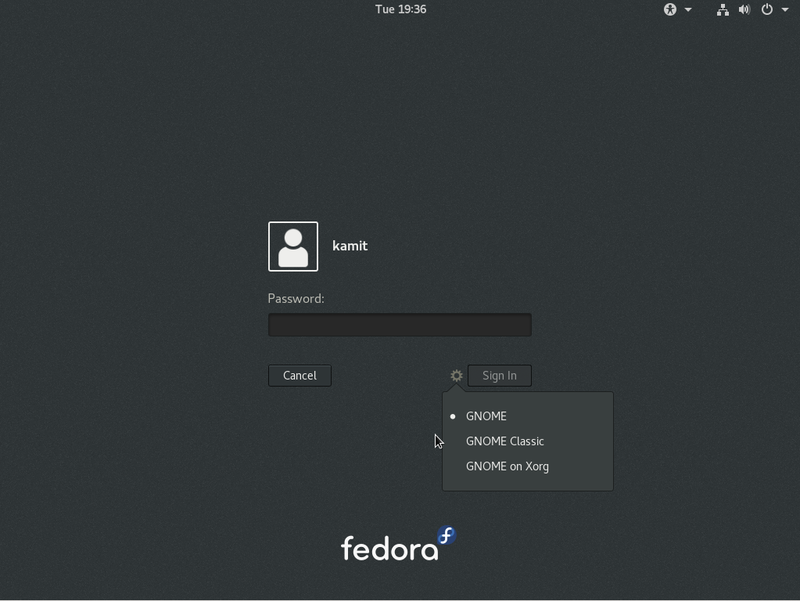 Thanks to all the chakra team and everyone in kde Gnu and upstream for making this distro a reality, Im looking up for the security enhacements and the next dev meeting to see where is going to go chakra in the future!!! 1. Semi-rolling releases. 2. Polished KDE implementation 3. Very fast package manager* 4. Relatively easy installation. If the security issues are taken care of (especially having the option to start/configure the firewall during installation), I will probably use this as my primary OS. It is great to see the developers responding (positively) to honest reviews like this. Looking forwards to the next release (beta?). *Package management: I still need to wrap my head around the package management in Chakra. Seems like if all the dependencies are self-contained in an application, it should work well without breaking during upgrades. But having the dependencies ‘bundled’ into the applications – does that not duplicate the libraries and consume memory (albeit very little)?